We are running or are involved as collaborators in several national and international academic projects regarding response to current and novel treatments, regulation of pigment cells, genetic profile and immunological aspects of vitiligo. Optimization of UV-treatment: We are focused on constantly optimizing the treatment regimen for light treatment of generalized vitiligo, to maximize the benefits and minimize the side effects for our patients. Recently we brought in a new device for targeted UVB-treatment, whereby only the actual white spots are treated with an intense focused light at the optimal wavelength and the surrounding, normally pigmented, skin is spared. Vitiligo autoantigen identification: In a previous collaboration we have been part of identifying SOX10 as the autoantigen related to vitiligo in patients with the syndrome Autoimmune Polyendocrine Syndrome type I (APSI). We are now in collaboration with Dr Hedstrand and Dr Hagforsen at Uppsala University, trying to identify new autoantigens by screening human melanocyte cDNA-libraries with sera from patients with halonevi, paraneoplastic vitiligo and patients with Vogt-Koyanagi-Harada syndrome. Evaluation of clinical trials of an immunomodulating drug in the treatment of generalized vitiligo. 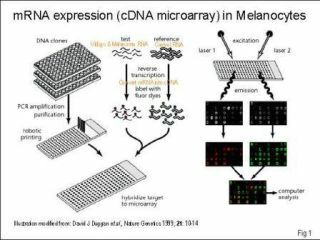 Expression microarray to compare the level of specific melanocyte mRNAs from vitiligo donors with mRNAs purified from normal control individuals and melanomas. Fig 1. 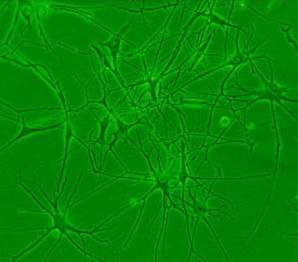 Development of cultivation systems for adult human melanocytes (pigment cells) in defined conditions that has revolutionized the possibilities in vitiligo research and treatment. -Vitiligo and Piebaldism, Treatment of Leucoderma by Transplantation of autologous melanocytes. Publication year 2001, ISBN: 91-554-5080-6. -Surgical Management of Vitiligo, published 2007 by Blackwell Publishing Ltd, 9600 Garsington Road, Oxford OX4 2DQ, UK, ISBN: 978-1-4051-4521-3.
to be a European agent for the new targeted (focused) UBV device Levia� for the effective treatment of vitiligo.